Workforce development is critical to the success of our organization, our city, and our employees. Here’s how we are prioritizing the development of our staff. Urban Initiatives has been using sport to empower and support Chicago’s communities for the last fifteen years, but recently we have renewed our focus on empowering and supporting employees within our own organization. 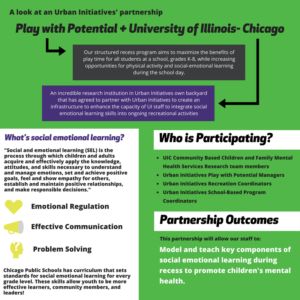 In the last 12 months, Urban Initiatives’ Play with Potential recess program has led the way as we work to optimize our workforce development practices. Workforce development continues to be critical not just for the success of our organization but also for our individual employees and for our city’s future. Urban Initiatives is uniquely poised as an organization to make an impact on our city through workforce development because of our mission: sport and play have an inherent power to bring people together and teach lessons that are critical to success. The Play with Potential recess program team at Urban Initiatives is working on a replete workforce development program that will arm our recess staff with the tools and skills they need to be successful team members at Urban Initiatives. 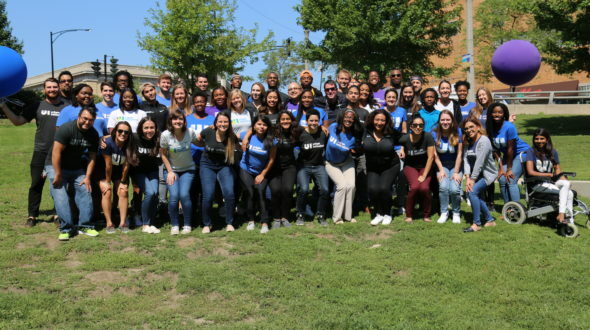 This team is diverse and dynamic and works both in the Urban Initiatives office and at school sites across the city to provide structured recess programming aimed at maximizing the benefits of playtime for all students at a school, grades K-8 while increasing opportunities for physical activity and social-emotional learning during the school day. 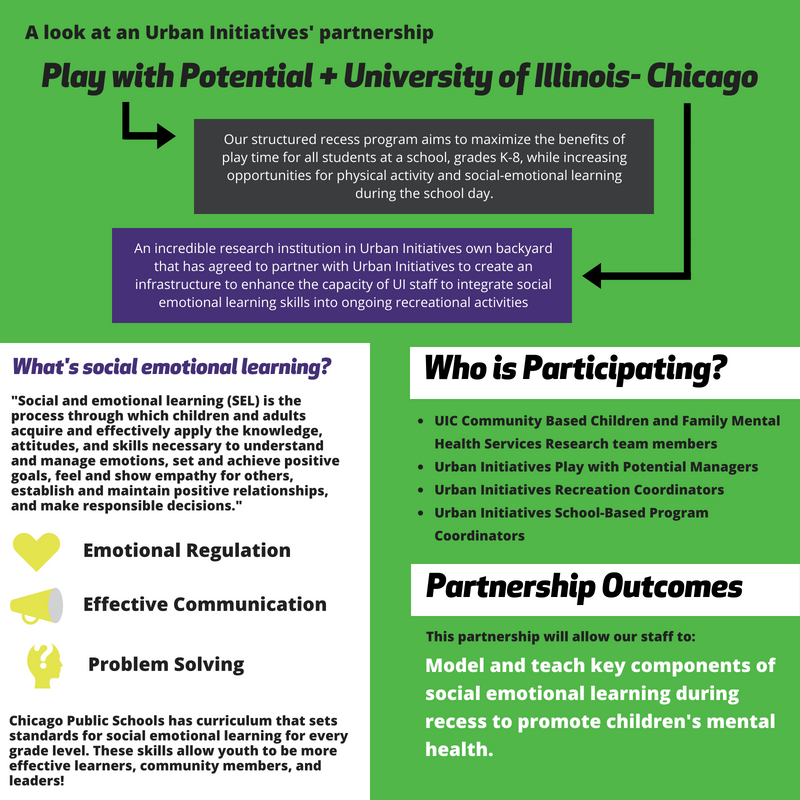 The Play with Potential team has partnered with the University of Illinois-Chicago to implement a robust set of tools including Adaptive Leadership, Mindset, and Emotional Intelligence that is designed to help our coaches build skills that help them grow as leaders in their schools. The Play with Potential team is also participating in activities that build social and emotional skills. Through emotional regulation, problem-solving, effective communication, and active listening they will not only be more effective team members but also be more effective youth development professionals with the capacity to begin passing these lessons on to the students in their school communities. Finally, our Play with Potential staff members are participating in a Professional Learning Community which is an opportunity for them to meet monthly and share best practices with staff members that work in other schools that they don’t see regularly. This platform provides a space for teaching Leadership Development concepts and social emotional learning modules. Through these trainings, Play with Potential’s team is expected to grow stronger and more effective at implementing Urban Initiatives robust recess curriculum. This training will also provide a space for these members of our team to become stronger members of the workforce more generally and adopt critical soft skills. In a study completed by LinkedIn, it was shown that over half of US employers prioritize soft skills over hard skills, and the soft skills that are most coveted by American employers include leadership, communication, collaboration, and time management. Through these social emotional learning modules, adaptive leadership tools, and opportunities to collaborate through the Professional Learning Community, Urban Initiatives Play with Potential staff members are receiving the skills most valued by employers across the United States. The desire for increased workforce development is not a top-down decision- more and more employees across the board are showing that professional development opportunities continue to be at the top of their priorities when evaluating an employer. When employers don’t provide these opportunities, talented young professionals aren’t afraid to look for someone new who will. Many young professionals are now in a near constant job search because their employers are not providing enough opportunities for growth. While it continues to be common for employers to not do any or at least not enough workforce development it is vital for employee retention and organizational success for employees to offer their employees professional development opportunities. Urban Initiatives is always working towards the highest possible employee retention rates because research shows that employee turnover is costly- some estimates put the cost of losing a good employee at 1.50–2x their annual salary- and it’s important that Urban Initiatives maintain low administrative costs in order to provide the most resources to our participants and school communities. Additionally, turnover in staff for our recess program can be particularly detrimental because it creates a disruption in students’ experiences with the program. Play with Potential Manager, Jared Thomas notes that “There’s a noticeable difference when our staff is at a school for multiple years compared to schools that have experienced staff turnover. When staff are there consistently, they get to know the students, form stronger relationships with them, build and improve upon processes, and the program gets stronger. Our strongest programs are those that have had the same staff members for multiple years.” Unlike other organizations where employee turnover might threaten their bottom line, employee turnover at Urban Initiatives can negatively impact the quality of our curriculum. Urban Initiatives’ mission makes us uniquely positioned to effectively develop our employees. Urban Initiatives teaches our students that the power of sport can impact their academics, leadership skills, and social emotional learning. The power of sport can have similar impacts on our employees. In fact, there is evidence that demonstrates that employees with a sports background are more confident and have more developed leadership skills than employees without sports experience. Much of our in-house professional development is steeped in sport and play. Staff meetings frequently include opportunities to learn through play, and team building activities are our bread and butter. Additionally, many of our employees are former athletes- drawn to our mission through their experience with sports- and able to capitalize on those familiar experiences to make the most of professional development opportunities. By incorporating sports and play into our professional development lessons, our employees can build effective teams, quickly learn skills and directly apply them to their work in our recess program. Urban Initiatives is working to build a safer, stronger, and smarter Chicago and as we look towards the future of our city we see workforce development as a priority. The obligation to effectively develop employees is not limited to the big businesses of Chicago, but also organizations like Urban Initiatives that provide critical services to Chicago’s youth. If our mission is to empower Chicago’s next generation of leaders then we first need to empower our employees to be leaders themselves. By demonstrating leadership, social emotional skills, and effective communication as employees and as team members we can model this behavior for the youth that we serve. Teaching our employees has an effect on thousands of Chicago Public School students, their teachers, families, and communities. The potential for a ripple effect created by intentional and effective workforce development at Urban Initiatives is undeniable. By prioritizing workforce development as an organization, we can continue to grow and best serve the city of Chicago.